Rudimentary forms of vibration were used in an attempt to stabilize metal parts almost two centuries ago. “Hammer relaxation”, the art of stress reduction through the application of repeated hammer blows to generate high amplitude, gradually decaying vibration, is but one example of early efforts at vibration induced metal stabilization. Other uncontrollable, unpredictable, and too slow efforts to employ vibration included the early foundry practice of dropping castings from considerable height into a sand pile, the “natural aging” or curing process of storing work pieces outdoors for 6 to 18 months to allow the metal to expand and contract with the daily changes in ambient temperature, as well as peening, a process which, although well-accepted as a method to preclude stress corrosion, is only marginally effective as a method of metal stress relief. Because of the severe limitations of those unsophisticated forms of applied vibration, industry increasingly turned to using furnace treatment in an attempt to thermally stress relieve precision components which had critical dimensional requirements. For over a century, thermal stress relief was the primary method by which industry tried to stabilize metal components, regardless of size, configuration, type of metal, or how the metal was formed or joined – if the cost of stress relief could be justified. On applications or work pieces that were not cost effective to thermally stress relieve (furnace treatment cost is proportional to weight), or on those that could only be partially stress relieved, industry resorted to using the rudimentary methods mentioned earlier. Weldments made of lo-carbon, high-strength steel. These types of work pieces suffer a reduction of strength and toughness in the heat-affected zone of welds, or hydrogen embrittlement, or both when thermally treated. Work piece configurations with large variations in wall thickness. Components that, because of size, could only be thermally stress relieved in sections, i.e., 1/2 in-the-furnace, 1/2 out-of-the-furnace. The section being treated would be cordoned-off from the section not being treated. The result: a Thermal Gradient Zone in which there would be a new stress pattern. 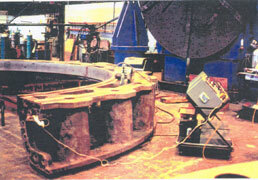 Components that required significant stock removal, especially if the work piece required that the stock removal be performed in an asymmetrical fashion such as on components with a T-slot pattern, or bolster plates. In these types of applications and others, the limitation of thermal treatment (and the marginal effectiveness of the then available non-thermal treatment methods) mandated that industry, both equipment manufacturers and end-users, develop a more effective and practical method to stabilize metal components. From 1920 to 1940 infrared photography experienced significant development, which, by WWII, resulted in highly improved reconnaissance imagery. Foundries and metal heat-treating facilities, for example, could be easily identified from aerial photographs. And, because these industrial processes were key to the Third Reich’s war machinery industries, these facilities became prime targets for Allied bombing. By 1943 the severe shortage of large castings forced German heavy industry to turn to fabrications, but, without heat treating facilities, they faced the problem of how large weldments could be stress relieved in preparation for precision machining. The Germans soon discovered that large fabrications transported by truck or rail from the weld shop to the machine shop, as compared with those that were welded and machined in the same or adjacent facilities, displayed superior dimensional stability during machining. As the war progressed, the Germans made “transport after fabrication” of large precision components standard procedure. Although manufacturing managers and engineers weren’t sure why this phenomenon occurred, some believed it was the result of workpiece flexure, and experimented with methods to generate flexure in a more predictable and cost effective manner, for example with applied vibration. Four-thousand miles away, United States manufacturing of war machinery had greatly increased both the number and size of fabrication facilities, and precision requirements of the metal working industry. American engineers had also discovered stress relief through workpiece flexure, and began to actively pursue using applied vibration to excite workpieces. As related in the 1943 paper by McGoldrick and Saunders, published in the Journal of American Society of Naval Engineers, Vol. 55, No. 4, pgs. 589-609, [available from our On-line Library] the US Navy used vibratory stress relief to stabilize a variety of components, especially large jigs and fixtures used in shipyards. After WWII, engineers from both sides of the war were frequently co-workers at firms in the United States, particularly in firms manufacturing paper mill machinery and components. Often these components were fabricated out of materials that responded poorly to thermal stress relief (eg, 300 series stainless steel), or were bi-metallic. This shortcoming of the thermal process was the motivation for developing commercial equipment specifically designed to perform Vibratory Stress Relief. One such firm was LODDING ENGINEERING, Auburn, MA (now KADENT WEB SYSTEMS). As the use of wider paper mill machinery became necessary, LODDING faced the daunting challenges of machining longer doctor blades and backs with increasingly tighter dimensional tolerances for these machines. Elementary vibration equipment was developed which produced results that clearly indicated the potential of vibratory stress relief. The VSR Technology Group of AIRMATIC INC can directly trace its historic roots, through several subsequent VSR equipment manufacturers, back to these beginnings.